I n 2004, U.S. Army Specialist Christopher Long was honorably discharged after he sustained injuries from a rocket propelled grenade (RPG) attack while deployed to Iraq. In addition to his life altering injuries, Long’s life was forever changed when he lost his best friend and mentor on the same deployment. 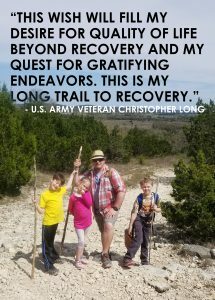 Focusing on his own personal recovery by working through symptoms of PTSD and major depressive disorder, all while adjusting to life in the civilian world, Long found peace while hiking and camping. Realizing the profound impact hiking and being in the outdoors had on his life, Long took a step back from his career and focused solely on healing by submersing himself in the beauty of the outdoors. In January of 2018, Long reached out to Hope For The Warriors and applied for A Warrior’s Wish of hiking and camping equipment to help him achieve his goals of taking on more advanced hikes while enjoying the outdoors with his family and fellow veterans. 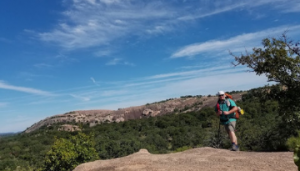 Inspired by his story, his wish was granted, and he is now equipped with the necessary gear to train and conquer the Continental Divide Trail that is on his 2019 goals to crush! Months after his wish was granted, Long shared this sentiment. After the War, I spent many years tearing myself apart inside out. I thought I tried everything from prescription medicine to group therapy to just flat out being in denial. In the end when life had me down so low I thought I would never get back up I discovered Natural Healing through Nature Therapy. me. My mind is no longer clogged with the sounds of traffic on the expressway or the sounds of new subdivisions being built one after another. My therapy sessions now take place on the trail of peaceful ambiance, with the sounds of birds making music and the breeze blowing through the trees. This type of therapy forces a feeling through my body as if my soul is being cleansed of the toxins the taint our very existence. 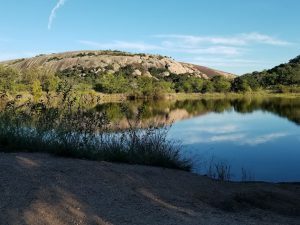 I have backpacked the along the red boulders of Enchanted Rock, and through the green trails of Pedernales Falls and on through the bubbling springs of the Lost Maples in the Texas Hill Country along with many more locations along the way. My near future is no longer filled with a negative void and a question of existence but is now filled with positive goals such as my upcoming trip to the top of Texas at Guadalupe Peak in West Texas and along a 96 mile through hike of the Lone Star hiking trail in East Texas and eventually working my way up to a through hike of Continental Divide Trail in the Mid Western United States. I have once again reminded myself what it is like to reach down deep inside and pull up that intestinal fortitude to drive on, I have found hope, motivation and pride along the way. I would not have been able to accomplish so much if it had not been for Hope For The Warriors and its A Warrior’s Wish program. I was granted a Wish for a new adventure gear which has provided me with the required equipment to embrace the great out doors and find my inner peace. I have discovered a new way of healing and it is the most ancient form of healing on this earth, and that is Natural Healing through Nature Therapy.